Mine: One of the first films I remember loving. Great cast from Hayley to Brian Keith. Very well told. It still brings tears to my eyes. Maureen O'Hara is breathtaking. 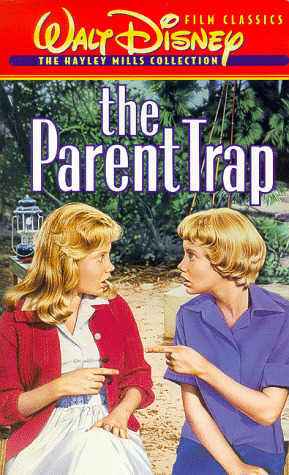 Leonard Maltin/Plot synopsis: Hayley plays twins who've never met until their divorced parents send them to the same summer camp; after initial rivalry they join forces to reunite their mom and dad. Attempt to mix slapstick and sophistication doesn't work, but overall it's fun. Erich Kastner's story filmed before as 1954 British film TWICE UPON A TIME. Hayley starred--as mom--in 1986 and 1989 TV sequels. Remade in 1998.